KIWIFOTOS KLC Series Lens Caps are center-squeeze snap-on type lens caps for lenses in different diameters. 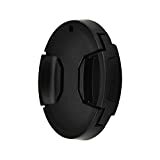 This series lens caps protects the lens from scratches, moisture, dust and fingerprints when the lens is not in use. Made of ABS, the lens cap is lightweight and durable. A hole is designed on the cap to get through a string, which is effective to prevent loss of lens cap. Besides, this cap is designed to use with filters and lens hood simultaneously. This entry was posted in Discount Photography and tagged 46mm, Camera, Canon, Central, Durable, Fujifilm, Kiwifotos, KLC46, lens, Nikon, Olympus, Panasonic, Pinch, Premium, Samsung, Snapon, Sony, Type, Universal by Ball Photo. Bookmark the permalink.